Susquehanna University, a historic liberal arts college founded in 1858 in Selinsgrove, Pennsylvania, sits near the majestic Susquehanna River. The drive to the campus follows unspoiled views of the riverside north from the state capital in Harrisburg. 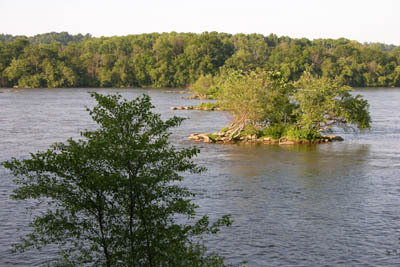 At 464 miles, the Susquehanna is the longest river on the East Coast, flowing southeast to the Chesapeake Bay. It is also the longest river in the United States free of commercial shipping traffic. It provides drinking water for some six million people and recreation for many more. That’s why Susquehanna proudly touts its Freshwater Research Initiative that is funded with a major grant from the Richard King Mellon Foundation. Founded in 2014, FRI now serves as a hub and training center for a number of institutions that come to campus to study water quality in the Susquehanna River. 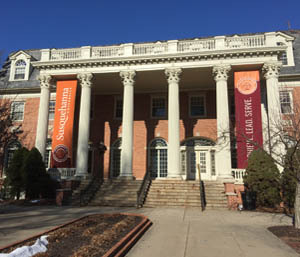 It is also why, in addition to its historic, tree-lined central quadrangle, Susquehanna now has three LEED-certified buildings and a serious commitment to sustainability. Susquehanna University has now become the fortieth college to join the Rachel Carson Council Network (RCCN) following a visit to the campus by RCC President Dr. Bob Musil. Musil was brought to Susquehanna by President Jay Lemons who hosted a presidential dinner for Musil with key faculty, administrators, and students. Musil gave a campus-wide lecture, “Rachel Carson: Is Her Legacy Relevant Today?” and taught combined classes with students from creative writing and thinking, Shakespeare and the environment, and environmental ethics. Musil’s visit was coordinated by Professor Kathy Straub, Chair of the Department of Earth and Environmental Sciences, an atmospheric scientist who has worked on climate change at the National Center for Atmospheric Research (NCAR) in Boulder, Colorado. Straub introduced Dr. Musil at his public lecture and brought student sustainability leaders to a luncheon with him. A highlight of Musil’s visit was his appearance with President Lemons at a WOW session where students and faculty meet in an open seminar with drinks and refreshments. The topic was “Should Scientists Speak Out,” prompted by recent attacks on science by the Trump Administration. The group used a number of background readings from different points of view including Musil’s recent blogs on the subject.